At 10:30 P.M. on April 14, 1865, while Major Henry Reed Rathbone, Clara Harris, Mary Todd Lincoln, and Abraham Lincoln watched the third act of Our American Cousin from the state box in John Ford's theater, twenty-six-year-old John Wilkes Booth entered the box, aimed his derringer, and discharged a shot that struck the left side of the president's head. Nearly three weeks later, following a series of dramatic funeral pageants stretching from Washington, D.C., to Springfield, Illinois, Lincoln's body was laid to rest and his place in national memory began in earnest. Some may find it difficult to imagine that Lincoln's contemporaries would not have responded to his death with as much pomp and circumstance and devotion as they could command. Because Lincoln has become such an integral part of the nation's image, and because citizens have witnessed similar tributes during the intervening years, the pageantry and emotionality occasioned by his death, somehow may appear appropriate, inevitable, and, therefore, perhaps rather unremarkable. But this vantage point overlooks an immediate context that makes both contemporaneous responses to his death and his current status as one of the nation's most beloved and legendary presidents entirely remarkable. In the best of times before his death Lincoln was only a moderately popular president. At other times "Lincoln was the object of far more hatred than love" (Hanchett 1983, p. 7). In the election of 1860 Lincoln received only 39 percent of the popular vote—the second lowest percentage of anyone ever elected to the presidency. Lincoln not only failed to carry a single slave state in this election, he also received only 26,388 of the 2.5 million votes cast in the slave states. Nor did he fare well in the urban North. As the historian David Potter has noted, "Whereas the North as a whole gave him 55 percent of its votes, in seven of the eleven cities with populations of 50,000 or more, he failed to get a majority" (Potter 1976, p. 443). Further, although Lincoln received 180 of the 303 electoral votes, which gave him 27 more than he needed to win the election, his margin of victory very likely was more a result of good strategists and the support of his Secretary of State William Seward, than of Lincoln's popularity. This is particularly telling in light of the fact that the electoral college inflates the margin of victory. In the election of 1864 Lincoln received 55 percent of the popular vote and 212 of the 233 electoral votes, which seems to imply that his popularity increased significantly during his first term in office. However, several points strongly suggest the opposite. Given the generally accepted belief that changing leaders in the middle of an allconsuming war invites catastrophe, for example, 55 percent of the popular vote and 212 of the electoral votes hardly seem resounding expressions of confidence or popularity. Moreover, the population of the United States increased by more than 4 million between 1860 and 1864; there were several more potential voters in 1864 than there had been in 1860; the states that had seceded did not participate in the election of 1864; and Lincoln actually received nearly 700,00 fewer votes in 1864 than he had received in 1860—all of which adds an interesting dimension to Lincoln's contemporary status. Even more telling indicators of Lincoln's status in the eyes of many of his contemporaries are the attacks people so frequently and openly made against his character, the constant threats to his life, and the glaring references, even in eulogies, to his flaws. Both North and South "newspapers were filled with suggestions for violence against the president" (Turner 1982, p. 69). In addition, "threatening letters arrived [at the White House] continuously and in large numbers" (Hanchett 1983, p. 23). It is difficult to know whether these constant threats would have been acted out or whether persistent rumors of organized efforts to kidnap or assassinate Lincoln had any firm basis in reality. One assassination effort obviously did come to fruition, and even then criticisms of Lincoln did not cease. When an individual dies, as Sigmund Freud pointed out, the living typically "suspend criticism of [them], overlook [their] possible misdoings, issue the command: De mortus nil nisi bene, and regard it as justifiable to set forth in the funeral oration and upon the tombstone only that which is most favourable to [their] memory" (Freud 1953, p. 16). Most citizens appear to have abided by that dictum; or, at least, most manifested some degree of restraint subsequent to Lincoln's death. Many others did not. None of this is to suggest that Lincoln was hugely unpopular, that a majority of citizens disliked him or disapproved of his policies or politics, or that the often frustrated rhetoric of his contemporaries was somehow inaccurate. To be sure, Lincoln's election to the presidency was not especially well received, even in the northern states. Throughout most of his first term in office both he and his policies frequently were objects of ridicule and derision in British and French presses, and southerners loathed him openly and incessantly. With each step Lincoln seemingly both alienated and attracted supporters. Then, the Union army's capture of Atlanta on September 2, 1864, barely two months before the presidential election, buoyed Northern hopes and virtually assured Lincoln's reelection. Yet, even Lee's surrender to General Grant five months later (April 9, 1865) produced mixed results, with Northerners celebrating "Lincoln's victory" and with Southerners vigorously pursuing a rhetorical campaign against "Lincoln's tyranny" that would continue well into the next century. Threats to his life were constant, violence and subterfuge were ever present, and some people publicly hoped for his death while others had been fearfully anticipating his assassination; therefore, Lincoln's contemporaries were shocked but not entirely surprised when they learned of his death. Against this backdrop one of the qualities that most impressed and perplexed citizens was the unprecedented character of Lincoln's death. Perhaps because human beings are "fated to puzzle out what it actually means to feel 'right,'" as cultural anthropologist Ernest Becker so aptly put it, Lincoln's contemporaries diligently sought some historical precedent, some point of reference that would place the assassination of an American president in proper perspective (Becker 1975, p. 104). Yet even those who focused on what they thought might be historically or emotionally similar incidents eventually concluded that Lincoln's death and its consequences were simply unprecedented. The assassination of Abraham Lincoln is a unique case. Despite his status in both past and present day, Lincoln is an individual whose contemporaries continued to criticize and deride him even after his death. Many of those same contemporaries memorialized his death and life as if he had been an intimate member of their family, sparing neither expense nor effort. A partial explanation for this disparity is that the death of a significant individual, even under the least objectionable conditions, necessarily places the living squarely at the center of a nexus of disorganized emotions. 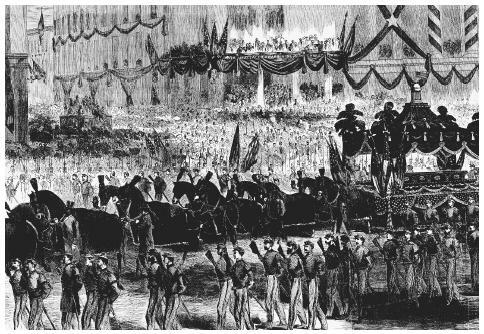 A drawing of President Lincoln's funeral procession through New York illustrates one of a series of dramatic funeral pageants that lasted three weeks and stretched from Washington, D.C., to Springfield, Illinois. they did solely out of fear for the status and stability of their social roles—or, for that matter, out of sheer admiration for Lincoln. It would be too simplistic for them to respond out of political considerations necessarily drawn into focus by the fact of and circumstances surrounding his death, or out of guilt that he had been placed in such an impossible position. Responses out of shame that so many had openly and persistently hoped and prayed for his death, or out of remorse that he had been constantly the object of threats and ridicule and derision, would alone be overtly simple. Even responses out of shock for the unprecedented manner of his death, or out of the possibility that his death would provide an opportunity for cultural transformation seem improbable. Much more likely, all of these forces and more were at work within Lincoln's contemporaries, who were bound together in their extraordinary efforts to commemorate his death not by any singular emotion or motive, but by a set of intense discomforts that derived from a number of sources and that impelled the living to go to extremes to attach their emotions to something concrete. "While we don't know exactly how the mind works in relation to emotion, how deeply words go when dealing with reality or repressions," Becker wrote, we do know that the death of an intimate occasions rhetoric, the meaningful articulation of symbols, through which "one tries to deny oblivion and to extend oneself beyond death in symbolic ways" (p. 104). In the liminal moments surrounding the death of a significant individual, those symbols finely articulate the ethos and world view that make life and death meaningful and that define how one ought to feel and how one can best deal with the way one actually feels. On the other hand, even given intense discomforts at a variety of levels, it is implausible that the rhetorical and cultural efforts of Lincoln's contemporaries immediately and permanently created the images of Lincoln that now occupy places of honor and reverence in the nation's "collective memory." Immediate responses to Lincoln's assassination and corresponding opinions of his character varied much too dramatically to have crystallized immediately and permanently into an untarnished hero-image. Indeed, the first and most obvious tribute to the nation's sixteenth president, the Lincoln National Monument in Springfield, Illinois, was dedicated on October 15, 1874. Yet the full weight of the nation's apotheosis of Lincoln did not wholly emerge until Memorial Day of 1922 when the Lincoln Memorial was dedicated in Washington, D.C. Equally important, even if those responses and opinions had been singular, creating a seemingly permanent element of the symbolic code that constitutes collective memory requires time as well as intensity. How, then, did Lincoln come to occupy such a special place in collective memory? Part of the answer, as Merrill Peterson's Lincoln in American Memory (1994) demonstrates, is that a myriad of citizens, working from different assumptions and different motives, have sought to appropriate—and often have successfully appropriated—Lincoln's image over time. And it is through such efforts that Lincoln has continually "belonged to the nation's cultural heritage as well as to its civil history" (Peterson 1994, p. 375). This helps explain why the same three conflicting images that dominated contemporaneous rhetoric about Lincoln later became the three dominant elements of the Lincoln myth—namely, "the rail-splitter," the man who journeyed "from a log cabin to the White House," and "the American Christ/ Moses" (Warner 1959, pp. 270–289 ). Different people memorialize, embrace, and seek to codify through public memory their different images of the memorable not merely because of temporal or spatial or physiological divergences, but because different cultures with different worldviews and ethoi require different images of and from their members. That there is a Lincoln myth at all undoubtedly owes much to circumstances; "reality," however mutable, lives within the possibilities of what is given and of what is conceivable in the midst of what is given. Would the memorial responses to his assassination been different had he not signed the Emancipation Proclamation? What would had been the response if many of his contemporaries had not needed to believe that he publicly and personally identified himself as a religious individual? What if he had not been president during such an enormous civil crisis that marked an unmistakable moment of cultural transformation? In short, had the circumstances surrounding Lincoln's life and death been substantively other than they were or other than what his contemporaries believed them to be, the memorial responses to his assassination would have been other than they were. Yet, the struggle to recreate Lincoln reveals a great deal more than the distant sentimentality of nineteenth-century citizens, of some distant past that is only marginally related to the present. Indeed, Lincoln's place in national memory reveals an ongoing ideological conflict through which various groups continuously have sought to lay claim to the nation's hegemony and public memory. And that, fundamentally, is why his image remains so integral to the nation's memory. Becker, Ernest. The Denial of Death. New York: Free Press, 1975. Cole, Donald B. Handbook of American History. New York: Harcourt Brace Javonovich, 1986. Freud, Sigmund. "Thoughts for the Times on War and Death." In J. Rickman ed., Civilization, War and Death. London: Hogarth, 1953. Holmes, Frederick Lionel. Abraham Lincoln Traveled This Way. Boston: Page & Co., 1930. Morris, Richard. Sinners, Lovers, and Heroes: An Essay on Memorializing in Three American Cultures. Albany: State University of New York Press, 1997. Turner, Thomas Reed. Beware the People Weeping: Public Opinion and the Assassination of Abraham Lincoln. Baton Rouge: Louisiana State University Press, 1982. Warner, W. Lloyd. The Living and the Dead: A Study of the Symbolic Life of Americans. New Haven, CT: Yale University Press, 1959.